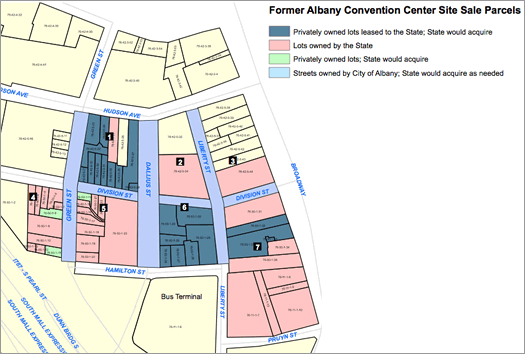 It won't be the site of the Albany convention center, so what will it be? What is the next life of the southern edge of Albany's downtown? 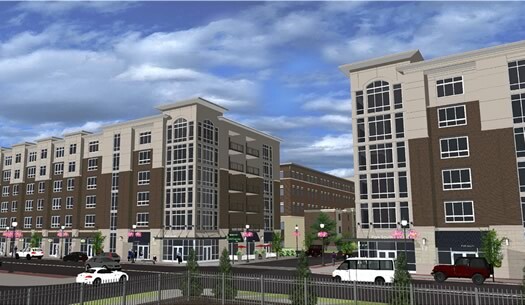 With its large size and premier location in the heart of downtown Albany, this Project offers a unique opportunity for a major development in the City's urban core. The Site features convenient proximity to the area's transportation access points and is less than a quarter mile or closer to the City's commercial, cultural and governmental destinations. The Project will serve as a key component of the City's initiatives to attract urban re-investment downtown to meet market demand while simultaneously revitalizing the area with a vibrant mix of uses. So, yeah, this project -- whatever it ends up becoming, if it ends up becoming -- could be an important part of the ongoing redevelopment of downtown Albany. Clipped from the docs accompanying the RFP. The site is on about 4.5 acres on the southern edge of downtown Albany. There are also about 1.9 acres of adjacent city streets. Empire State Development is clearly aiming for some sort of mixed-use project. The RFP clearly states that "Market rate housing must be a component of any Proposal." And one of the priorities is "revitalizing the Site as a destination to serve workers, residents and visitors alike, both during the work day and into the evening and weekends." The oldest building in Albany -- the 287-year-old Van Ostrande-Radliff House, at 48 Hudson -- is adjacent to some of the parcels included in the project. And the project site includes 50 Hudson, also a historic building. The RFP notes that, "Scale, setbacks, and context of new development should be respectful of both of these historic properties." The project site also include historic warehouse buildings along Broadway (the E-Comm Square buildings). "These properties are reflective of a historic fabric that is important to the City--therefore priority will be given to proposals that show creativity in integrating these properties into the overall development." Also: Liberty Park, the city's oldest park, is nearby (but not part of) the site. The place barely registers as a park now, so it would be interesting if new development could highlight it. Would you like to buy a street? With the principles of connectivity and walkability in mind, and as indicated above, Proposals may include the purchase of Streets and reconfiguration of the impacted street grid for optimum Site development. However, proposals should avoid creating city blocks that are too large, as they tend to discourage walkability, disrupt connectivity and limit opportunities for creative corner developments. The City of Albany recently passed a Complete Street ordinance and will be implementing complete streets design guidelines within the next year. Any reconstruction of City streets should consider complete street principles to the greatest extent practicable. The Site currently contains extensive surface parking. Respondents should provide adequate parking for the number of visitors and residents anticipated to be generated by a Proposal. Respondents are encouraged to leverage the use of existing district parking structures. An opportunity also exists to partner with the Albany Parking Authority on the construction of a new parking facility. Of course, one of the big questions for this section is what's considered "adequate" parking. And to what extent can transit play a role? Those two questions ended up being a big topic of discussion for the Park South redevelopment, and it's reasonable to think they could surface here. Proposals may be reviewed by ESD, OGS and other City and State officials. Reviewers will consult with the City regarding the proposals. The sale of the Site may be subject to approval, as required under applicable law and regulation, which may include approval of the ESD Directors, the Commissioner of General Services, the Public Authorities Control Board, the Comptroller of the State of New York, and the New York State Attorney General. It will be important to watch how everyone involved here interprets the word "consult." For what it's worth, Albany mayor Kathy Sheehan was quoted in the ESD press release: "By working together the City and State will create a development that is vibrant and integrated into our walkable, livable, urban fabric." A rendering for the Park South project. This (potential) project reminds us of the Park South redevelopment project, both because of its size and in what it's trying to accomplish: a residential/retail/office project on a site that's been essentially wiped clear. The RFP doesn't mention guidelines for project cost. But just for some rough perspective, the cost of the Park South project was announced at $110 million. Another part of the residential angle for this potential project: To what degree will there be an effort to create apartment units with rents that are closer to, say, $1,000 per month rather than $2,000? Up to this point, developers have asserted that cost has pushed them toward creating high-end housing downtown. So, is there a way to work the numbers -- or just an outright request -- to open things up for a more diverse range of rents? Something that occurred to us while reading through the aims for the site: Could this project "just" be a chunk of residential with offices and some relatively small-scale retail? Or does it need a big centerpiece of some sort? And if so, what could that be? Back in 2013, Omni Development had pitched this site for an aquarium/science museum/IMAX theater project. Publicly, at least, that idea seems to have fizzled. One of the (many) interesting aspects of this (potential) project is that it's on the south side of Albany's downtown. Much of the recent downtown development has been focused along State Street, or farther north (with many eyes also looking toward the Warehouse District even more to the north). It will be worth watching to see if this project helps focus more attention on that southern side of downtown, and by extension, the South End. And is there a way for this potential development to better knit together the South End with downtown? A quick look at a satellite view of this project site makes one aspect of it immediately, strikingly clear: It's fenced in on two sides by highway, both I-787 and the arterial leading to the ESP. It's yet another example of how the choice to build those roadways continues to shape the area. The arterial, especially, plowed a divide between downtown and the South End. There seems to be some momentum to seriously reconsider the future of 787. And it will be interesting to see if a major project on this site affects any of the thinking around the topic. Downtown Albany really needs affordable condos, not the $400,000 one-bedroom condos like the ones at Chapel Street. I'm talking about nice, modern condos that are about $200,000 to $250,000 for a two to three bedroom. You can buy a nice condo like that in Montreal for those prices. Why can't we have here? Because the entrepreneur has to make his return on investment. Higher property taxes relative to other areas in the capital region are a major cost for developers and there's only one way to offset higher fixed costs; higher revenue. As we grind through and add more development to the area this tax burden will decline but there needs to be a pretty substantial amount of square footage occupied to do so. I think it will happen, just slowly. Before building anything big, we NEED to get rid of all those elevated highways. Bring 787 to a ground level boulevard, rebuild the Dunn bridge with a new approach, then bury or move the train tracks. No one living in these proposed condos wants to see onramps, they want to see the river (along with everyone else in Albany). Squeezing a big development into this space without dealing with 787 essentially grants another 50+ years of status quo for the riverfront. Tough area to build. No amount of architectural design can negotiate the concrete columns and highways that will wedge the development, along with parking lots (existing and new), etc. Not really prime real estate, to be honest. Guy is right. While there is some demand for residential units, this is not a very appealing area. I could see somthing like a public/tourist attraction, or something, but residential? It will be very ghetto. Wow...how about a grocery store, maybe a movie theater to go in\around that area? There is nothing down there that could sustain or even invite someone to want to live there. And I agree with @Guy, who wants a new Condo that stares at 787 and the lousy concrete jungle of DT Alb. Triple A baseball would be cool, but lets go up a level. Put in a soccer stadium and get an expansion MLS team. How about a park? Turn this into a lush green space, and have farmers markets here in the summer. 787 isn't coming down for a very long time, but I would love to see the arterial to the Plaza torn down, the street grid recreated, the insane interchange rebuilt and simplified and a new, simpler bridge between here and Rensselaer. The transit piece should also be much more successful here than at AMC, since so many of the city's routes already meet at the bus station, and CDTA is advocating for a transit center to tie the services together. I would love to see a mixed use retail and residential neighborhood created, with apartments above stores instead of superblock projects with blank walls. A small market would be nice, but not a supermarket, which would be overkill. Fortunately, the baseball diamond idea doesn't fit with the RFP's elements of small blocks and walkability. It would be very sad to see the site wasted like that. I think that Downtown could use a 4 year State College, maybe a Professional College under SUNY/UAlbany. The presence of students and a school Downtown would lift the local economy. Just as students rent in the so called Student Ghetto area, and support local bars, restaurants, coffee houses, convenience shops and stores, so a Downtown Student Population would buoy local rentals and businesses. Some have suggested a 2 years school, but this would be a mistake. A Community College would compete for Students with HVCC, SCCC, Maria College, and other existing 2 year schools. A 4 year College could draw in students from all the above 2 year schools. As a Professional College, it could bring in Military Students, State Workers, Older Students, Working Adults, and Others who desired a 4 Year Professional Degree. The courses provided could also meet the needs of Local Businesses and State Government. A Student Population would boost the local economy, and make Downtown more than just a place where people work in the day and disappear in the evenings, leaving the area only as a ghostly Entertainment District. A paying Student presence would boost rentals and maybe draw in more businesses and services, making Downtown more residential than it is right now. I was disappointed that Empire State College didn't get the train station. Triple A baseball? Can't happen as long as the ValleyCats are in town. They have exclusive rights to the area, no other minor league baseball team is allowed to set up shop here. I assume the MLS stadium proposal was a joke. I don't care how many soccer moms there are in Clifton Park, the sport simply doesn't have anywhere near enough support around here to make a professional soccer team work. I don't know if this site is the best place for it, but a community college somewhere in Albany would be a good thing, not a "mistake", as Dan puts it. Currently, Albany County isn't pulling its weight in this arena; as it does not host a community college of its own, students residing in the county are forced to travel outside the county (to HVCC, SCCC, or elsewhere) in order to attend community college. Furthermore, I doubt Hudson Valley would be adversely affected by a community college in Albany County; many people would argue that HVCC has become overcrowded and could use a good deflation. I think JayK's ideas are probably both the best and most realistic. The only change I would propose is condos instead of apartments. Some people still want to own their own homes these days, and around here it's difficult to do so without living in the suburbs (or the more suburban sections of the cities). Not to sound like a certain condo troll from the TU blogs, but affordable condos can be found in many other cities in this country; why can't we have that here? I still think that a Community College in Albany would be an error. It would end up fighting for students with SCCC, HVCC, and other regional Schools. A 4 Year College could offer courses to locals who are not enrolled in degree programs, so if someone wanted to, they could go to the local Professional College rather than commuting out to HVCC or SCCC. Furthermore, those Schools (HVCC, SCCC, Columbia-Greene, etc.) could all act as Feeder Schools to a 4 Year School Downtown. Most people who attend Community Colleges and get 2 year degrees want to get a 4 year degree, and a Professional 4 Year College under SUNY would provide that option to meet a real demand. The key benefits to the area would be jobs (Staff, Faculty) and a paying Student Population that would bring in money for Rentals and Local businesses. A Student Population would lift the economy of Downtown, and Evening Programs would bring in people after hours, combatting the emptiness there tends to be at night in that Neighborhood. The area would remain an Entertainment District, but would also be an Educational District, which would elevate the quality of the Neighborhood. A 4 Year School could also offer Programming and Cultural Events that would enhance the Downtown experience. Professional Programs offered might include Hospitality Studies and a Culinary Institute, which could complement the Downtown Restaurant and Entertainment Sectors. Courses and Programs could also be custom made for Downtown Workers. They would now have more incentive to stay Downtown in the Evenings, to spend money and attend Night Classes to further their education and careers. Such Programs would inject life and money in the Downtown Area were there is not so much right now. Has this project been completely abandoned? Are we going to let this area sit vacant for 5 more years? I have a great idea. We can build little streets full of architecturally beautiful brownstones. Maybe some middle class families. Throw in some local businesses and shops, maybe a doctors office and a dentist...... Wait what was there before all these hideous steel highway over passes??? Elmer any thoughts on the wonders of government city planning? ?